Let me begin by saying I am surprised that this dish made it thus far. Don’t get me wrong…it was delicious! 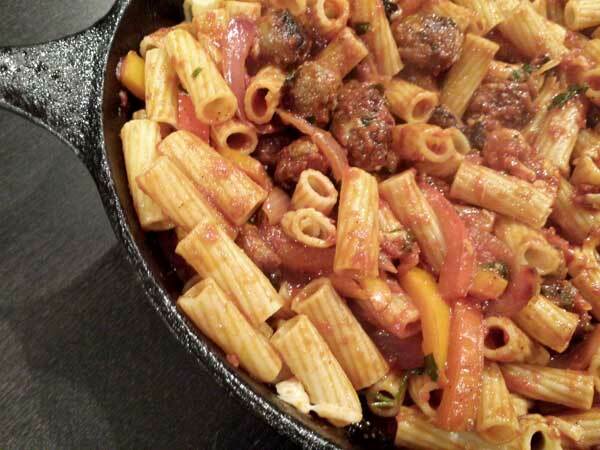 Sausage with sweet peppers and onions get tossed in a tomato sauce and cover thick, ribbed rigatoni noodles. The epitome of fall flavors in my opinion! But when I made this I had a “mom brain” moment…do you ever have one of those? It’s almost like an out of body experience as the chaos of your surroundings make it almost impossible to wrap your mind around whether it would be better to slice and dice your veggies or brown your sausage first…add a dash of hanger pains and a screaming toddler and you have quite the predicament on your hands. 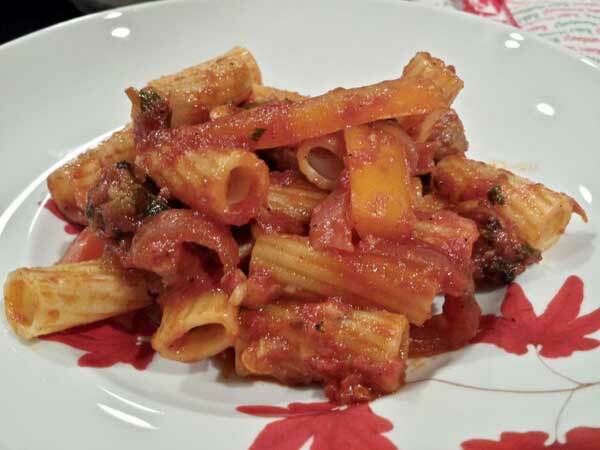 Nevertheless, one bite of this pasta will melt away any stress you may have while warming you inside and out! Wanna learn how to make it? Let’s start at the very beginning and begin by browning about a pound’s worth of sausage still in its casing. I did not do this…DON’T BE LIKE ME! By browning the sausage in its casing as a whole THEN slicing it you will have uniform sausage coins to accompany your delightful pasta sauce. It will be much more visually appealing than my sausage coins which look more like sausage meatball wannabes. 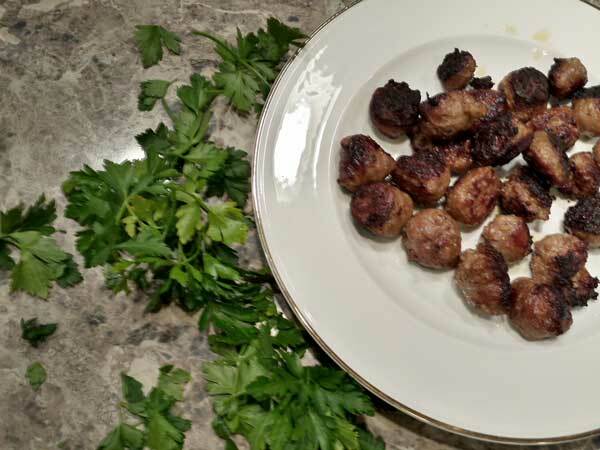 Set aside the cooked sausage and toss in the peppers, onions and garlic to the same pan that you cooked the sausage and sauté till they are soft. I think it tastes even better if you get a nice char on the veggies! Just make sure to not burn the garlic. I managed not to do that; however, I had to momentarily leave my post to console a toddler melt down concerning a conflict between a square peg and a round hole. I am sorry honey…but they don’t go together! OY! Pour in some white wine to deglaze the pan and scrape up any brown bits from the bottom of the pan. There is some major flavor in there! While you’re at it…pour yourself some wine too! Stir in some crushed tomatoes, oregano, and season with salt and pepper flakes. Simmer together for about 15 minutes. Around this time my toddler came marching in the room demanding food…he always seems to do this right around the simmer time…food is almost ready baby…hang on tight! 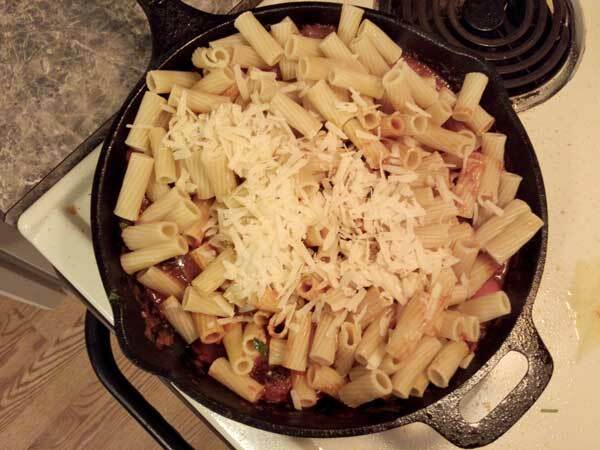 Add in some parsley to the sauce then toss together with one pound of cooked rigatoni. Toss so that every single ridge gets covered in the velvety tomato sauce. Then stir in the cooked sausage as well as some parmesan cheese. If the sauce needs a bit of loosening, stir in some pasta water. Did I mention my toddler is still screaming at my side clawing at my jersey dress as if that were to get him closer to his meal? Quite frankly, it brought us closer to him witnessing a wardrobe malfunction…if you know what I mean! And with a huge sigh of relief I say those two little words that will send any toddler running to the table…”DINNER TIME!” Like magic the chaos ceases. My toddler sits down as if the tornado of emotions that just blew through my kitchen never existed, and he quietly eats the prepared treasure! This is powerful stuff…here’s to you mom…for those who have been there you know…for those who have not…just keep the wine chilled! Cook the Sausage links in the olive oil over medium- heat till browned all the way through. Transfer to a cutting board and slice the sausage into little coins. Set aside. Add the bell peppers, onions and garlic cloves to the oil and cook until softened. 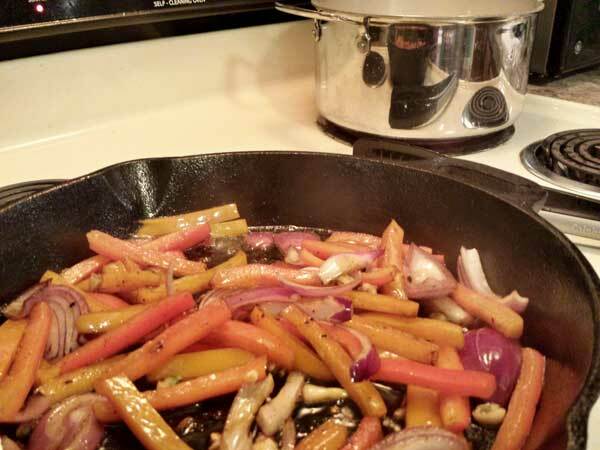 They are even better when the onions and peppers get a little color, just be sure to not burn your garlic. Add the white wine to the pan and scrape up any brown bits from the bottom of the pan. Stir into the mix the can of tomatoes and 1 cup of water. Sprinkle in the dried oregano and season generously with salt and red pepper flakes. Simmer the mixture for about 15 minutes. Stir in the parsley.